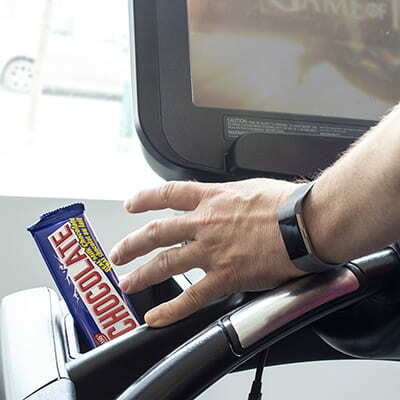 Chocolate can Boost your Workout Performance! Too Good to Be True? Chocolate milk has been a longtime favourite for those looking to fuel and recover from a hard workout. It’s a relatively good source of protein and carbohydrates to boost energy, as well as being chock-full of micronutrients. But, what about a chocolate bar? I heard the buzz going around (albeit this could just be the sugar high) that chocolate can boost workout performance and improve recovery. I like chocolate. I like performing better. Did I mention I like chocolate? This must be too good to be true, right? While cocoa is high in antioxidants and nutrients thought to increase blood flow which aids recovery, there is minimal reliable research to back up the claim that chocolate will get you next year’s gold medal. A study in the Journal of the International Society of Sports Nutrition in 2015 suggested that dark chocolate aided in reducing oxygen cost in cyclists, touting that dark chocolate is rich in flavanols, which can aid in greater performance during moderate intensity exercise. However, this study was performed in a small group of only eight men, without a non-chocolate consuming control group. Chocolate is also very high in sugar, which can lead to the oh so familiar sugar crash, as well as digestive issues and feelings of sluggishness – not true friends of high performance! What I do know is that a post-workout meal should contain carbohydrates and protein to replenish our energy levels and aid in muscle repair and growth. Chocolate will certainly perk you up, but you are better off choosing a nutrient dense snack that will keep you satisfied longer. If you’ve got a sweet tooth, go for a peanut butter and banana smoothie, or yogurt and berries. Long story short, there is not enough viable research available yet to say with confidence that chocolate will make us better athletes. As the old saying goes, enjoy everything in moderation and you do not need an excuse to indulge every now and then. I know I will! Megan is a Bachelor of Kinesiology graduate from the University of Alberta. She is a CSEP-CPT certified Exercise Specialist with the MacEwan University Sport and Wellness fitness team. Summer is coming and with the arrival of the warm weather comes job postings for summer lifeguard and swim instructor positions. Summer pools across the country typically start new staff training around the May long weekend, or early June and are fully up and operational by the first week of July. With this timeline in mind, it’s still not too late to become fully certified for summer. The Lifesaving Society is the standard setting, certifying body for lifeguarding in Canada. 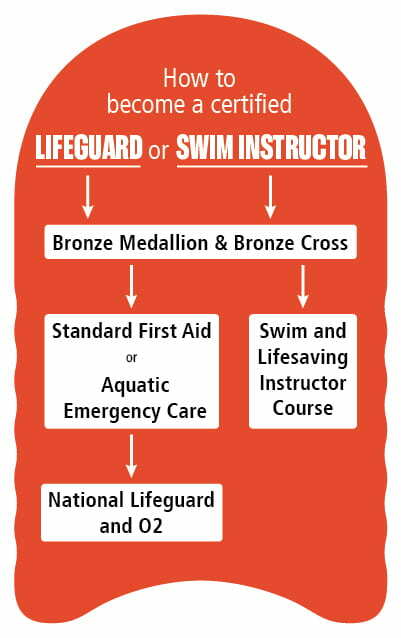 The National Lifeguard certification is just that: national. Once certified, you can work as a National Lifeguard in any province. Lifesaving Society Swim for Life and Lifesaving Instructor certifications can also be transferred province to province. separate certifications, many facilities, including MacEwan University Sport and Wellness, co-deliver these programs. This means that you earn both certifications by registering for one course. Once you have your Bronze Cross certification you have earned the first prerequisite for both your lifeguarding and instructor certification. However, you also need to be 16 years of age to be certified as either a Lifesaving Society lifeguard or instructor. Some facilities required you to be 16 years of age before you can register for the course, but here at Sport and Wellness you simply need to be 16 years of age before the last day of the course. To become a National Lifeguard there is one additional prerequisite that you need to obtain: a government workplace approved Standard First Aid certification. Here in Alberta, the province publishes a list of approved first aid training courses on a quarterly basis. Some facilities will offer first aid training as a stand-alone course, here at MacEwan we co-deliver Aquatic Emergency Care (AEC), which is a government of Alberta approved Standard First Aid certification, along with National Lifeguard so you only need to register for one course to obtain both certifications. Sport and Wellness has all the certification courses required for you to obtain both your lifeguard and swim instructor certification, so you can be fully certified by May 12 (Lifeguarding) or June 2 (Swim Instructor). But don’t wait too long to register: Bronze Medallion and Cross courses start the last week of April. If you have questions about the certification process, please contact aquatics@macewan.ca. Victoria has been training lifeguards, and swim and lifesaving instructors in both Alberta and Ontario for over 12 years and is a Lifesaving Society National Lifeguard Trainer and Swim/Lifesaving Trainer. She is also MacEwan University Sport and Wellness newest Aquatic Programmer. “Dance is music made visible,” said George Balanchine, one of the most influential 20th century ballet choreographers and co-founder of the New York City Ballet. It is an expression of emotions, thoughts, and ideas done through movement and rhythm. There are hundreds of dance styles around the world; it is the heartbeat of every culture and the history that shapes our world today. From Disco to Hip-Hop and Two-Step to Tap, there is truly a style for all abilities, all interests, and all musical preferences. Dance embraces multiple genres, styles, and traditions and is constantly evolving. Everyday movement requires unilateral strength and coordination, think about walking upstairs or stepping out of the vehicle. Athletes use unilateral movements when they jump off one leg, land on one leg, and have a sharp change of direction. 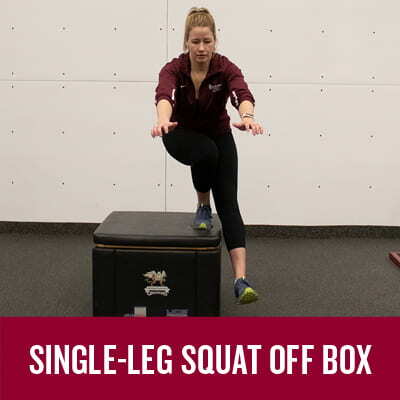 The third exercise in this series is a Single-Leg Squat off a Box, which can be seen a modification to the pistol squat. The reasoning behind this progression is the lack of hip flexor strength to maintain the free-standing leg off the floor when doing a pistol squat. By elevating the surface on which the movement is done, the individual can work on the full range of movement as well as develop hip flexor strength. Individuals may find a noticeable difference between left and right limbs when first adding this exercise into their program. Maintaining proper trunk position and ankle/knee alignment is a key focus when performing this exercise. Squat down until your foot touches the ground or you reach your lowest comfortable point. Visit our website for our personal trainer bios and information on fitness program designs and individual and group personal training. Plus Registered Fitness Classes like Women & Weights. Rachel is a graduate from the University of Edinburgh with her Masters of Science in Strength and conditioning, she obtained her Bachelors of Physical Education graduate from the University of Alberta. She is a Certified Strength and Conditioning Specialist through the NSCA with a strong background in Olympic Weightlifting. Swimming is one of the best forms of cardiovascular exercise for people of all age groups and fitness levels. This low impact form of exercise offers a full-body workout that helps release stress and tension. Just like with every other form of exercise, correct form and technique will improve results and help minimize injury. Freestyle, or front crawl, is one of the most widely taught swimming strokes and is a popular stroke for fitness training. However, there are a lot of different components that create an efficient stroke. In this series we will be breaking down each component so that when put together, you will be able to build an effective and efficient stroke. The first step to mastering a swimming stroke is achieving the correct body position. Drag is the biggest obstacle that a swimmer needs to overcome to move efficiently through the water. With a body position that is horizontal in the water, you minimize the amount of drag force that is slowing your motion. Learning to have a good floating position is the starting point for all strokes. Start with your body straight and arms and legs extended. Your hips should be near the water surface and your head should be mostly submerged, with your head in anatomical line with your body and eyes looking toward the bottom. Some body types will find holding this position difficult, as your feet will begin to sink. To counteract this, try inhaling deep into your belly, and pressing your shoulders and head slightly toward the bottom. Once you are comfortable and able to relax in a floating position, you will be ready to work on your flutter kick, which we will cover in our next installment of this series. Starting May 2019, Sport and Wellness will be offering a new Value-Added class on Thursday mornings- Swim Training. Visit our website for information on learn-to-swim and fitness swimming options. Jason is a full-time Lifeguard/Instructor here at MacEwan University Sport and Wellness. He has 19 years of aquatic and coaching experience and is a primary coach for both the Masters Swim and the Youth Triathlon programs at Sport and Wellness. Victoria is a Lifesaving Society Swim Trainer and Red Cross Water Safety Instructor Trainer. She is also MacEwan University’s newest Aquatic Programmer. As a Group Fitness instructor, I’m slightly bias when saying “I think Group Fitness classes are the best!” For someone who doesn’t like groups or being instructed on how to work out, you may completely disagree with me. And that’s ok! This article shares member and instructor experiences related to Group Fitness to showcase just how awesome it can be. I asked various individuals why Group Fitness is important to them and how it fuels their workouts. For all those skeptics out there, maybe these real-life comments might change your mind about Group Fitness and encourage you to give it a try. Coffee, coffee, coffee… everyone loves coffee. If you don’t, that’s ok. I’m writing this to try and convince you that coffee can be amazing. One of the many benefits of coffee is caffeine. Used by millions, coffee increases concentration and focus while preventing fatigue. Caffeine blocks the neurotransmitter adenosine that makes you feel sleepy. Another benefit is coffee contains many nutrients and antioxidants such as riboflavin, pantothenic acid, magnesium, etc. Finally, the most important reason to drink coffee— it’s delicious! The taste of coffee is almost entirely due to the volatile compounds produced when we roast coffee beans. When coffee beans are roasted from the pale green color to the light brown or dark brown, they undergo the Maillard reaction. As heat is introduced to the beans, the chemical compounds are broken down and reformed creating new distinctive tastes. Coffee can easily be one of the most complex forms of food with a multitude of subtle taste differences. 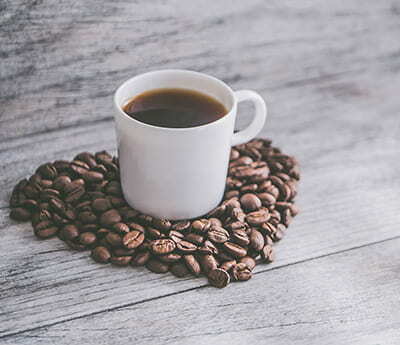 Instead of downing your coffee in two minutes to get the caffeine rush why not slow down and take a sip and try to break down what you’re tasting. After a while, you will start to pick up notes within your morning coffee that you never have tasted before. Coffee Beans: NEVER buy pre-ground coffee! It oxidizes faster than whole beans resulting in it losing flavor, even if it’s 40% off, it’s not worth it! There are many cafes around town that sell beans at an affordable price. Grinder: Do your research on a grinder and buy one that fits your budget, if you can afford a burr grinder you will be set to have consistent grounds. Amazing beans can be destroyed with a terrible grind, but decent beans can still be amazing with a good grind. Kettle, thermometer, kitchen scale: All of these may be things you already have so save your money if you already have one use it. If you want to invest, get an electric kettle with a gooseneck, a sugar thermometer and a kitchen scale with a timer. Follow your coffee makers instructions for making a pot. If you use a paper filter, rinse it first to remove paper taste. Drop your grounds into the bottom of your press. After one minute, lightly mix and fill the rest with remaining hot water. Put the lid on but don’t press down on the plunger yet. Pour out the old water, measure out 70g of coffee grounds and pour in into the filter. After the 45 seconds, slowly once again continue pouring water in until you have poured in 600g of water or it has been 2 minutes 45 seconds (the closer the two factors are, the better). After, wait till all the water passes before removing your filter and serving. There is no such thing as the perfect cup of coffee, everyone has their own preferred taste so experiment! Don’t take everything following as steadfast rules but as suggestions to starting your journey. The taste of coffee depends on beans and personal taste so try something new occasionally. It doesn’t matter as long as you continue to create something that you enjoy, because at the end of the day, do what makes you happy! Here are some of my recommendations for awesome places close by the school for some good coffee! Tim is a Bachelor of Commerce student majoring in Accounting and minoring in finance at MacEwan University. He has worked three years for MacEwan Recreation as a Recreation Assistant and is a coffee enthusiast. Naturally, we will have a stronger leg or arm and a weaker side, which often gets masked in traditional bilateral movements. Unilateral lower body exercises are an excellent way to train your balance and coordination as well as your strength and mobility in full ranges of motion. The second progression in this series is the Single-Leg Box Squat. 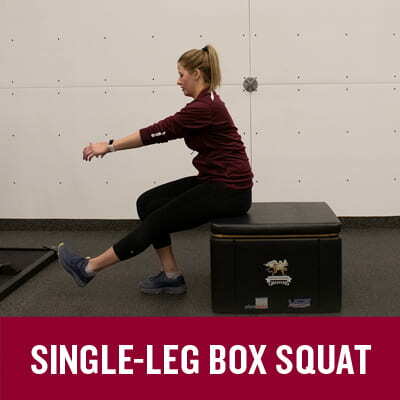 The benefit of the single-leg box squat is the ability to gradually increase the depth of your single-leg squat with a safety net while developing your leg strength throughout the full range of motion. Maintaining your core stability and controlling your lowering (eccentric) phase is key in this movement. Working on balance and coordination while developing unilateral lower limb strength in a larger range of motion. How many university students can honestly say they drink enough water every day? Further, how many university students can say that they know what “enough water” really is? It can be difficult to be committed to drinking water throughout the day as a busy university student, but here are some tips to clear up some confusion and make water consumption easy. Water plays a significant role in cognitive functions, and by not hydrating during the day you can significantly reduce the efficiency of your studying. When you are hydrated, you’re in a better mood, you can think much clearer, you are more attentive, and your memory is better. How much should you drink in a day? 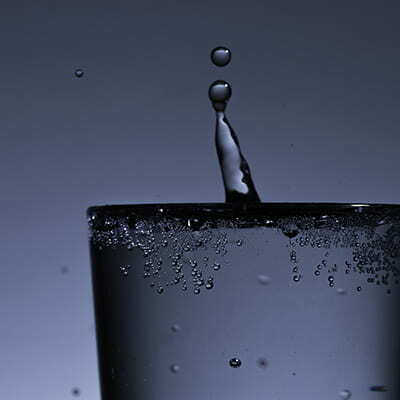 There is no magic number of cups or glasses of water that a person should drink in a day. According to the Dietary Reference Intakes from the National Academies of Sciences, Engineering and Medicine’s Health and Medicine Division, on average, males ages 19-30 require 3.7 L (13 -15 cups) of water per day and females ages 19-30 need 2.7 L (9-11 cups) of water per day in total, but these numbers include water intake from food, which should cover about 20% of your fluid intake. Keep in mind that how much water you need is different for everybody and will vary with individual activity levels. Thirst will always be the best guide! Does coffee, tea, or juice count? Yes! Recent studies show that coffee and tea do contribute to hydration despite their caffeine content. Juice also counts but keep in mind that juice contains a lot of sugar. However, whole fruits, such as melon and oranges, are a good source of water. Always have a water bottle with you. You can’t drink water if you don’t have water. Invest in a cool reusable water bottle and bring it everywhere you go. Set consumption goals. Mark times of day on your water bottle (at every 100 ml for example) and make sure you drink your water for that hour. Add flavour to your water. If plain water is too boring, add lemon or lime slices for flavour. Where to hydrate on campus? The University is full of water fountains where you can fill up your reusable bottles, and these fountains are present in all the buildings on campus. If you don’t have your bottle with you, the many vending machines on campus sell plastic bottles. Liv is a first-year student in the Bachelor of Physical Education program at MacEwan who competes at the AA level in ringette and instructs power skating to young ringette and hockey players in Edmonton. Krieger, Ellie. “Is Coffee Hydrating? (and the truth behind other hydration myths).” The Denver Post, 29 Aug. 2016. Are you out of shape and out of money? If so, don’t worry! There are plenty of ways to stay in shape that involve little to no cost! No matter the weather, why not take your workout outside? 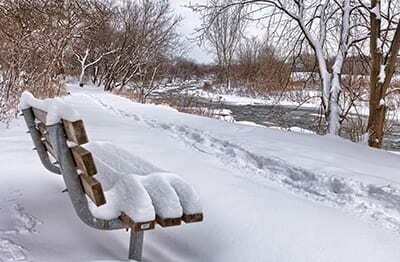 There are plenty of ways to stay active outside in all seasons. Start by dressing for the weather and then find something you enjoy and can stick with- skating, skiing, building snowmen or take to the trails. There’s plenty of trails in the Edmonton area for walking, jogging, hiking, snowshoeing, cross-country skiing, cycling, and getting active. Some of my favourites are Elk Island National Park, Rundle Park, Gold Bar Park, Hawrelak Park and Lions Park. You either love them or hate them, but stairs are an effective way to improve lower body strength and cardiovascular fitness. Did you know that the City of Edmonton has over 50 sets of stairs in the river valley? The top three sets of stairs that most people talk about are the Glenora Stairs, Hotel MacDonald Stairs and the Grandview Stairs. If you need some ideas, you could try walking or jogging up every stair or every second stair, side-step up the stairs or use the platforms to do additional exercises like squats, lunges, push ups off the railings or make use out of any nearby benches for triceps dips- just bring your gloves. If you are looking to add some strength training to your regime, bodyweight exercises cost no money and can be done nearly anywhere. Things like squats, lunges, pushups and planks can be challenging and very effective. If you find that you need additional resistance, weights aren’t terribly expensive and can be purchased at many local stores. If weights are not in your budget, you can make use out of things like soup cans for weights or old cloths for gliders. If you commit to doing a weight training workout for as little as 15 minutes a day, 3 – 4 days per week, you should start to notice a difference. If you need some guidance to start you on your fitness path, an affordable option is a program design where our exercise specialists can build a plan for you utilizing what equipment you have and whether you plan on working out indoors or outside. Cindy Hunt is certified with the Canadian Society for Exercise Physiologists as a Certified Personal Trainer. She has a Bachelor of Arts degree and graduated with Honours from the NAIT Personal Fitness Training Program. She holds numerous group fitness certifications. Her passion lies in motivating others to get active and pursue a healthy lifestyle. She has worked with athletes, dancers, aquafit participants, pre and post-natal woman, older populations and anyone who is looking to reach their fitness goals. MacEwan University Sport and Wellness is a full recreation facility in downtown Edmonton that serves the students and employees of the university, plus the public. This blog will feature tips, articles and advice from the highest educated trainers and aquatic instructors in the city.